Several Hireology team members recently attended the 2018 Society for Human Resources Management (SHRM) Conference, the largest conference for HR professionals in the world. The annual event brings together thousands of HR professionals for comprehensive learning sessions and networking opportunities. 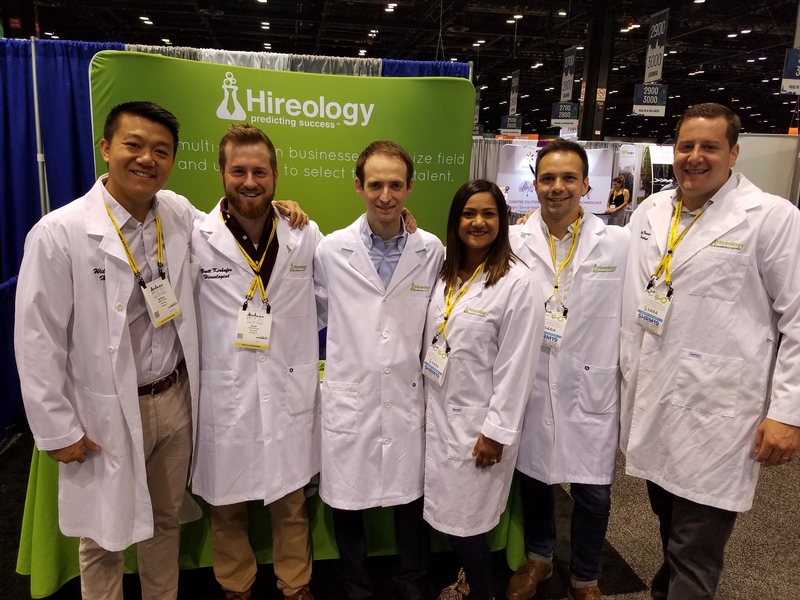 As a strategic hiring partner for small and medium-sized businesses across industries, Hireology attended the event to learn about the latest trends and hiring challenges HR professionals face today. Below, we’ve pulled together a list of several key trends we noticed at the 2018 SHRM Conference. The U.S. unemployment rate fell to 3.8 percent in May, the lowest rate since 2000, making the U.S. job market strong for job seekers, but highly competitive for employers. But up to 72% of adults keep track of current open jobs in the market, regardless of their current employment status. This means employers need to get job seekers excited about new job opportunities to consider leaving their current roles. To attract quality candidates in today’s tight market, it’s critical for every business to have a strong employment brand that includes a compelling career site. Up to 30% of quality candidates apply to open roles via career sites, the highest across all job applicant sources. To attract top applicants, a career site should include details on the workplace culture, career progression, and overall benefits, helping top candidates see the opportunity your team offers. It should also highlight employee testimonials and success stories, so prospective employees can really see what it’s like to be a member of the team. Based on conversations several Hireology team members had with SHRM attendees, many HR professionals feel they’re not using technology to their full advantage. They’re aware of the technology options available, but in many cases, have not made enough effort to adopt them. But without the use of hiring and talent management technology, many HR professionals end up spending too much time on manual, administrative tasks. For example, it takes an average of 1 minute and 44 seconds to review each job applicant – many of which aren’t even a fit for a role in the first place. And once a candidate makes it through most of the hiring process, an HR manager might spend a lot of time playing phone tag with references to complete reference checks. Tasks like these add up quickly, and HR professionals end up spending up to 30% of a 40-hour work week on administrative tasks. By embracing technology such as a hiring and talent management platform, HR professionals can save significant time on day-to-day tasks and instead dedicate time to more strategic work that can help the business grow. When it comes to reviewing applicants, instead of weeding through every applicant that comes through, one way to save time is by leveraging pre-screen surveys, which can be sent automatically as soon as an application is submitted, and gauges the applicant’s fit for the role. This way, the HR team and hiring managers only need to spend time reviewing a smaller pool of applicants who are a fit. Using a integrated hiring platform with a standardized hiring process also enables HR professionals to automate other steps in the hiring process, including skills, reference and background checks. Ultimately, this will save time and speed up the overall time to hire, leading to increased productivity and profitability. HR professionals are increasingly gaining seats on the leadership team, as the way employees are hired, trained and managed has a direct impact on any company’s bottom line. And the most successful HR managers constantly identify new ways to improve the hiring process and other aspects of the people side of the business. One emerging trend in the HR space is embracing data to measure the success of HR efforts and continuously improve. What is the total hiring velocity for each new hire at a given location? Are candidates getting held up in a certain hiring step? Are certain managers missing steps in the hiring process? Which sources give me the most quality applicants? Using these insights, HR professionals can take action to identify areas for improvement across locations and managers, and ensure quality employees are hired in an efficient manner. Data from the people side of the business also ensures the leadership team has visibility into what’s working and what’s not on the people side of the business.